Victorian/Colonial - tastefully renovated 2 bd condo on Cambridge-line. This condo has it all: living rm opens to front porch, sizable well laid out bdrms, oversized EIK w/mud rm & pantry, freshly painted (Ralf Lauren colors), 9ft ceilings, gas utilities, hrdwd flrs throughout, proff landscaped garden, direct access 2 car parking (1 garage & 1 outside), extra bsmnt storage, common laundry in bsmnt & 100% owner occupancy. 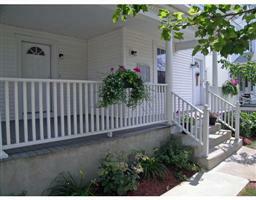 Steps to Cambridge Bus line & easy commute to Mass Pike. A true find!